First of all I really wanted to say thank you so much for the amazing support and kind words in regard to my last post! I really needed it and I feel so fortunate to have you in my life. Thank you :o) On to Inspiration Friday. 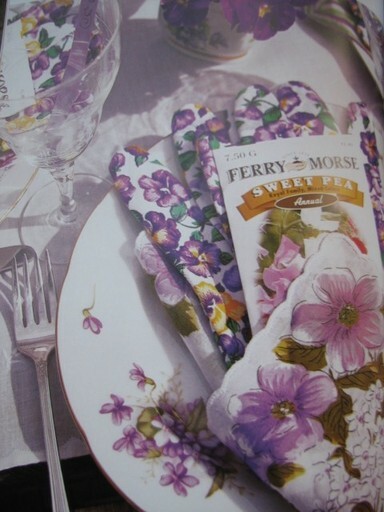 These are from a book called "Country Chic Table Settings". 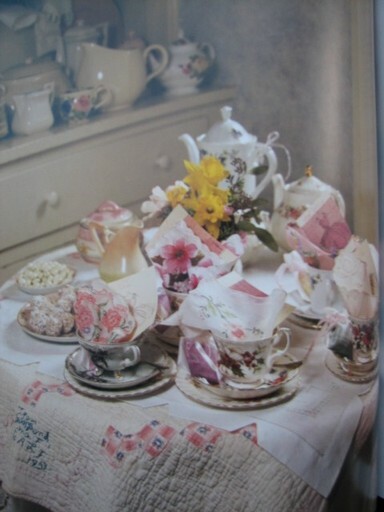 I really enjoy the quilt laid out on the table with the white table cloth over it. 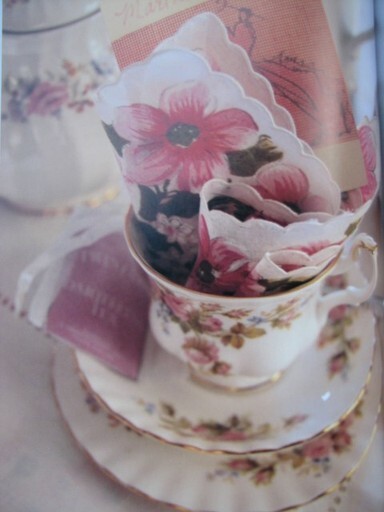 Not to mention those cute teacups,teapots and hankies! Well that's just seriously cute. Hello, can you say, that's adorable! And it is so spring/summer fresh. I hope that inspiration, hope, love, and happiness are close at hand for you. My best to you all - my dear, sweet, and supportive blogging friends. Just some random points of interest and inspiration for today. As we near Easter and hopefully receive some warmer weather, I thought I would use some photos that recently caught my attention. 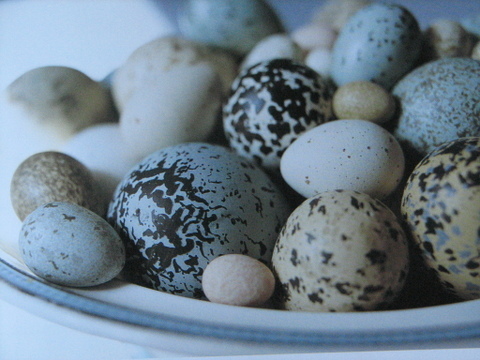 I love the colors in these eggs. They are very much the colors we have used in our bedroom. I would love if the weather was nice enough here in Minnesota to actually have a picnic outside, but I'm inspired by this photo and will plan one when it is warm enough. 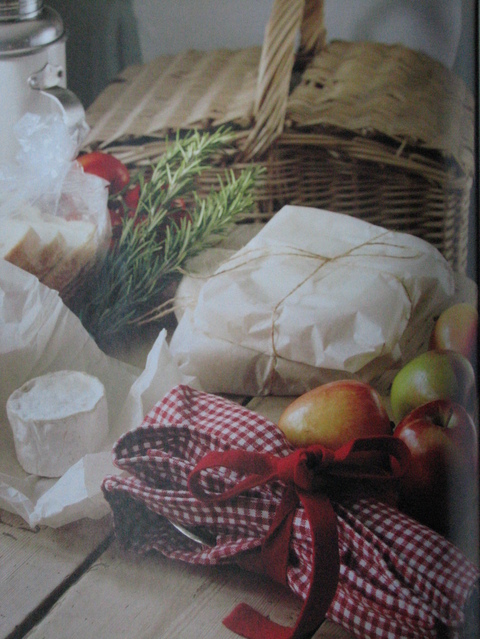 The basket, the sandwich wrapped in brown paper and tied with string, the red and white checked napkin holding the utensils - it's all so good. I guess it's the presentation of it all, the promise of something really great to eat. 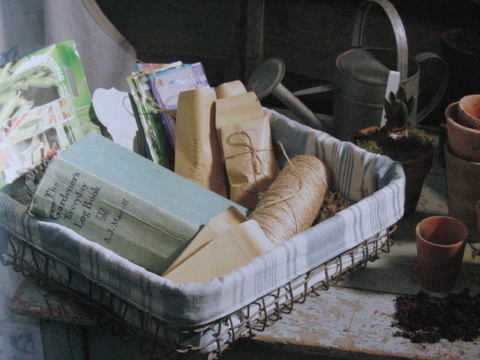 And speaking of the promise of warmer weather, this batch of gardening supplies displayed in the ticking-lined basket really gets me excited about gardening and being outside. There again is the use of brown paper and string. 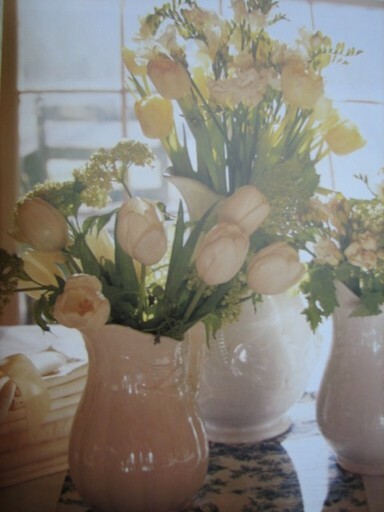 And this, well, I just thought it was pretty, and so natural, using elements from the outdoors to create a beautiful tablescape. 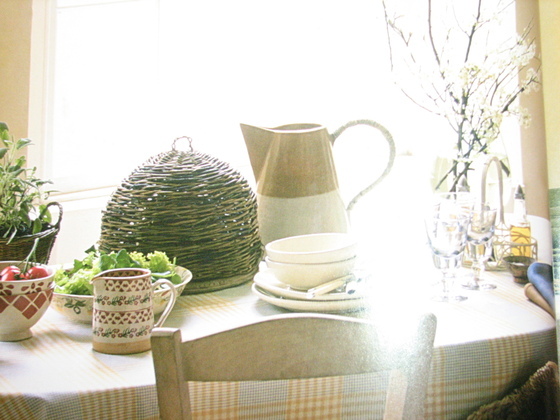 The sunlight streaming in and dappling the tablecloth, the use of potted herbs, baskets, budding Dogwoods in a glass jar - so pretty and pleasing to look at. The inspirational pictures for this post came from "The French Inspired Home" (2nd picture), "Romantic Home Sewing" (3rd picture), and "Shortcuts to Decorating Country Style" (4th picture). The picture of the eggs - can't remember where it's from as I was flipping through so many books and magazines (this would make my mom laugh, as she always does when I forget something and she doesn't have to feel alone in her forgetfulness - you are not alone Mom :o) I hope everyone has a wonderful weekend and Easter - my very best to all of you. Happy Spring! 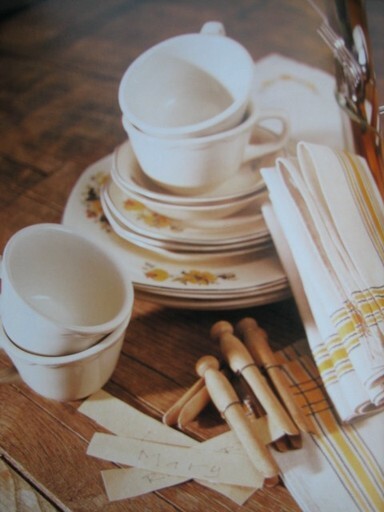 Following along with the "Inspiration Friday" concept I wanted to use this wonderful tablescape from Seasons of Cannon Falls as inspiration to all you as well as me. 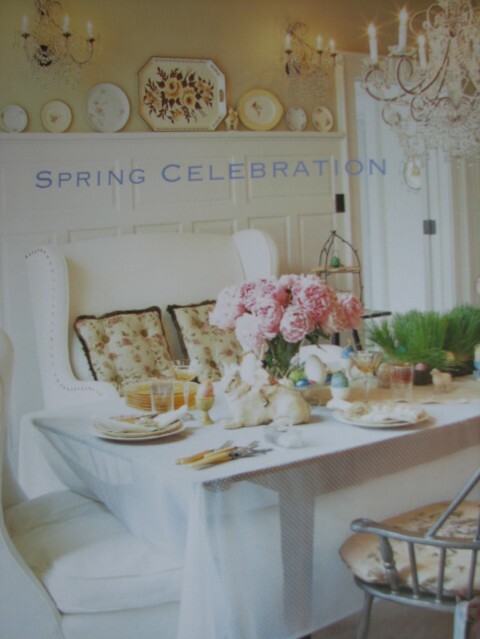 It's beautiful, and I love the idea of having wing back chairs or love seats at the table. And look at those flowers and the grasses. Look at these lovelies. 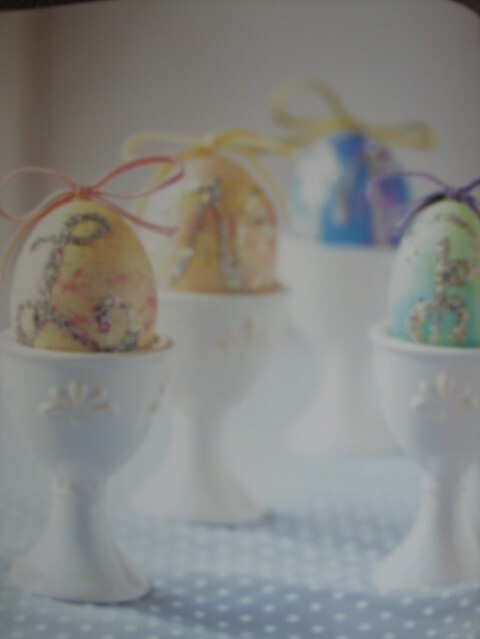 So pretty in the little egg coddlers. And this kitchen is so bright and sunny - looks like a good place to be. 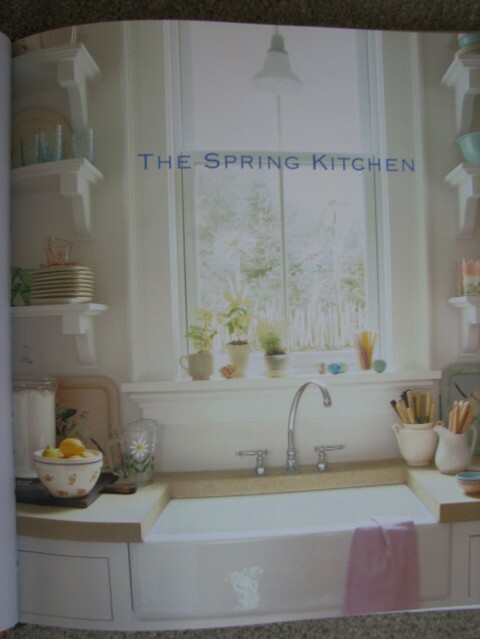 I really love the farm sink, and those open shelves would be so fun for displaying the goodies that I know we all have. I know that a couple of people out there are doing "inspiration Fridays", which is for the purpose of posting pictures of something that is a decorating inspiration to you. 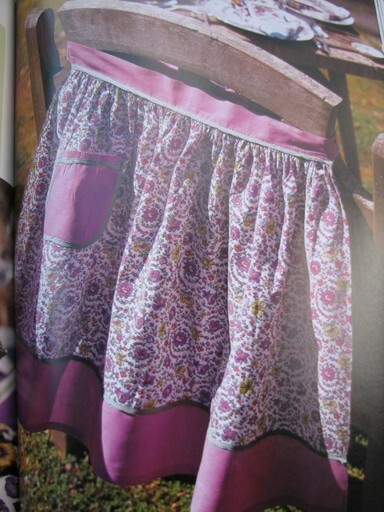 I have some shots from a couple of lovely new books that I got ("The French-Inspired Home", and "Where Women Create"). 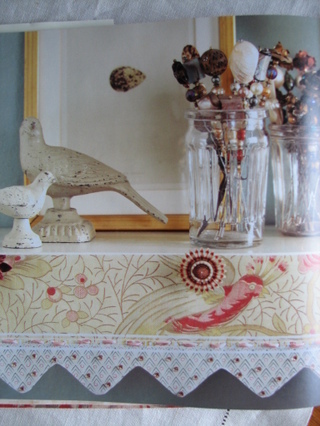 And there are shots from wonderful "Country Homes and Interiors - British Edition"). 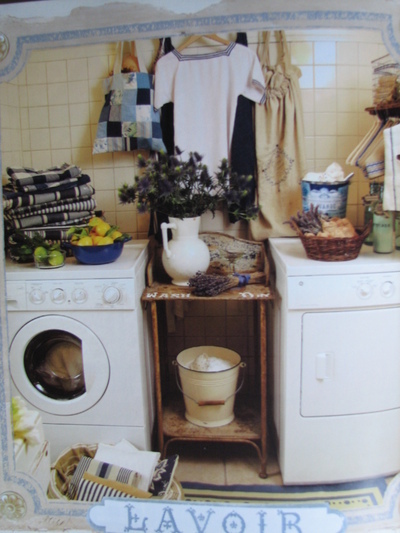 This laundry room is wonderful. It is in "The French-Inspired Home". 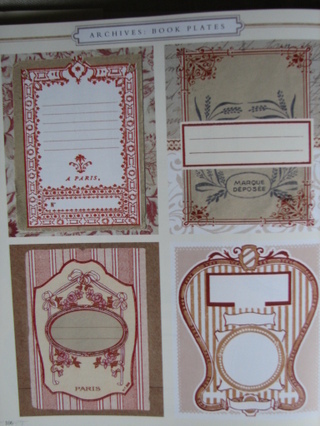 Within the same book as above, these wonderful labels are in the back pages (along with many others). You can scan them and print them out to use in your own home. I love the colors in these labels. 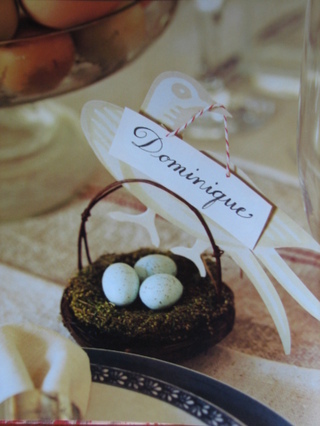 I thought this place setting was so cute with the little nest and bird - makes me want to be more creative with my tablescapes. I really like these colors and thought that using an edging like the one pictured would be great on a mantle or shelf. So pretty. Sorry for the darkness of this picture, bad lighting when I was taking it. This space is so wonderful. I especially love the cozy pillows on the floor by the cabinet. 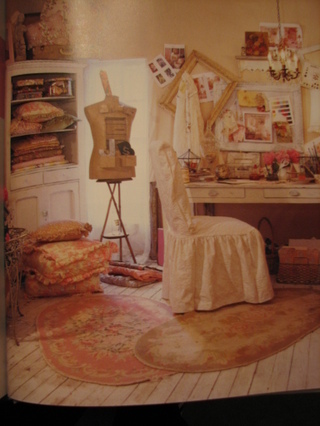 Also love the dressmakers form, the cabinet, desk, slip-covered chair. It's all so good. I think this display is so pretty. 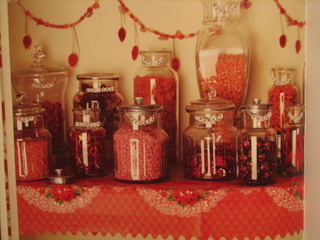 The colors, the jars - yum. And I really like the little string of letters that tell you what is in the jar. You could do a display like this and change out the colors whenever you feel like it - make it monochromatic, differing colors, whatever strikes you. So, that's a few of the things that inspire me decoratively. There are so many though - so much good stuff out there. Have a wonderful Friday!